Have you visited a guitar shop recently? If yes, chances are you have noticed a number of ukeleles on display. Well, the number of sold ukeleles around the globe have grown multi-folds thanks to both mainstream and independent artists who are jumping on bandwagon. Although ukelele is a guitar, it works differently from the other types. If you already know how to play an acoustic guitar, it might still be hard to learn the ukelele. Enter the guitalele, a six-string hybrid of acoustic guitar and ukelele that designed for guitar players. In 1997, the guitalele instrument debuted. But it took so long for musical instrument companies to fully embrace the guitalele fever. One of the popular adopters of the guitar-ukelele hybrid is Yamaha. 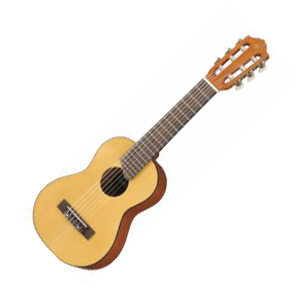 And in 2013, the Yamaha GL1 guitalele hit the shelves. The Yamaha GL1 is a low-end 1/4 guitalele. Like most of Yamaha’s low-end guitars, the GL1 is manufactured in its factory in Indonesia. In terms of hardware, it looks pretty simple and basic. The body is made from laminated woods — a spruce top and meranti back and sides. The neck is made from nato which has a flat fretboard housing 17 full-width frets and a half fret sitting on the extension over the soundhole. Since it is a six-string guitar, the GL1 is intended to be tuned like a standard guitar, capo’d at the 5th fret. The arrangement goes A-D-G-C-E-A from low to high. That means when you play a song on the GL1 guitalele, it would sound the same as it does on your full-size guitar, but a little higher. It has a 49mm nut which is actually a pretty wide one for a small guitar. The outer strings are closer to the fretboard than the normal acoustic guitar, and this makes fingerpicking a little bit difficult to do. The India rosewood fretboard looks a little bit dry in itself, but it works just fine. Nonetheless, give it a bit of polish and oil to make it smoother than it already is. 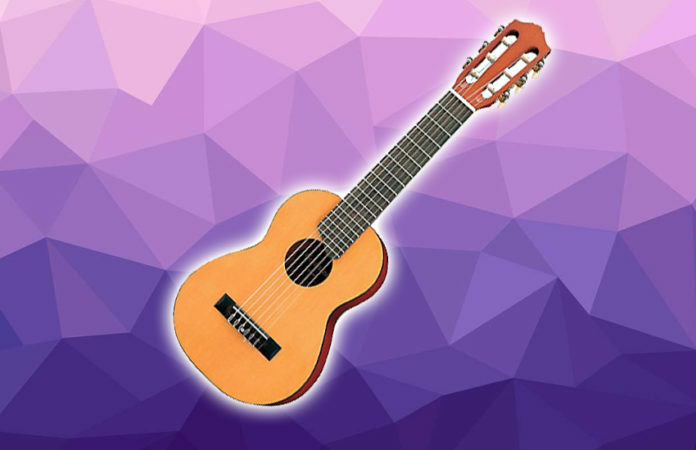 The nylon strings are the standard ones connected to the tie-block bridge and a set of classical style roller tuners. The plastic bridge saddle is elevated yet compensated to make the higher position chords and noodles more in tune. The Verdict: Should You Buy Yamaha GL1 Guitalele? Overall, the Yamaha GL1 guitalele is not the best guitar-ukelele hybrid out there, but it is definitely a decent one. The small body does not deliver a lot of oomph, but it projects pretty well. If you want to get the full ukelele experience, we suggest getting a purebred ukelele. For guitar players who do not want to go through another steep learning curve, the Yamaha GL1 would do just fine. It is not comparable to a ukelele, but the lower strings somehow give it a little depth into it.